Scott Carter (partially hidden) nods home Luke Hipwell's cross for Yaxley at Peterborough Northern Star. Photo: Tim Gates. Yaxley delivered a Christmas cracker of a performance to thump local rivals Peterborough Northern Star at Chestnut Avenue yesterday (December 27). The Cuckoos won 4-0 at a canter in front of a bumper crowd of 124 to keep in touch with Rushden & Diamonds and Holbeach, the top two in the United Counties Premier Division. 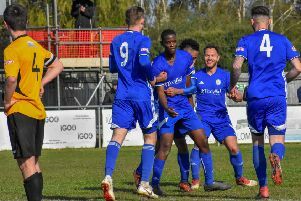 Both sides were missing key men, but it’s fair to say Star missed injured top scorer Avelino Vieira far more than Yaxley missed Dan Cotton, a potential Peterborough Telegraph footballer-of-the-year winner for 2014. Luke Hipwell fired Yaxley in front in the sixth minute with a cross that somehow deceived floundering ‘keeper Tom Roberts before nestling in the corner of the net and Star rarely threatened an equaliser before Liam Hook doubled the advantage just before the break. Hook, who had missed an absolute sitter midway through the half, followed up after Roberts had produced a fine save to thwart the impressive David Cobb. Star forced Yaxley ‘keeper Aaron Butcher into making just one tricky save when Jordan Macleod’s 20-yard striker was deflected towards the top corner. Otherwise Butcher enjoyed some catching practice as set-pieces were delivered into the Yaxley penalty area with very little thought. Catching a set-piece proved beyond Roberts when an inswinging corner from Cobb went straight into his net in the first minute of the second-half to effectively kill the contest. Yaxley went on to play the best football of the match for 20 minutes of the second-half and gained further reward when Scott Carter headed home a Hipwell cross from close range. Lewis Stone had powered forward through a couple of flimsy attempted challenges to start the move. The game petered out after that until Wayne Morris took it upon himself to deliver the game’s most stupid moment in added time. Morris upended Macleod on the edge of his area to earn himself an unecessary red card and a suspension. Peterborough Sports moved back into Division One’s top three with a commanding performance against a young St Neots Saints outfit. The visitors saw a man sent off after just five minutes and Sports spent 30 minutes knocking on the door until recent signing Matt Barber broke through. Ali Nyang scored a second goal just before the break. Dan Clements, Ondre Odain and Roberto Da Silva completed the scoring after the break in front of a crowd of 85. The Division One derby between Blackstones and Bourne was postponed because of pitch conditions as was the Premier Division clash between Deeping Rangers and Boston Town at Outgang Road and the Thurlow Nunn Division One game at March Town where Downham Town were the scheduled visitors. Today’s (December 28) Evo Stik Northern Premier Division game between Stamford and Grantham is off as in-form Spalding United’s fixture with Division One South leaders Sutton Coldfield.